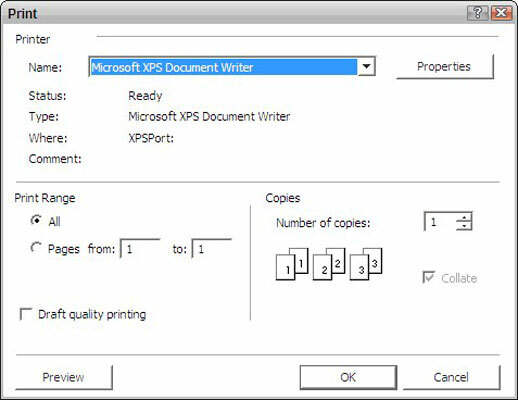 Before you print a document in Windows Vista, you can choose what pages to print, how many copies to print, whether to collate, and you can choose to print only the objects you’ve selected in the file. This sounds like a lot of decisions to make, but Windows Vista makes it simple. After you open the file in the application it was created in (for example, you open your PowerPoint presentation in PowerPoint), use this path to open the Print dialog box. The options in the Print dialog box might vary, but they generally include the following: Choose All to print all pages in the document; choose Current Page to print whatever page your cursor is active in at the moment; use the Pages area to specify a range of pages, such as 3-11 to print pages 3 through 11, or 3, 7, 9-11 to print pages 3, 7, and 9 through 11; choose Selection to print any text or objects that you have selected within the file when you choose the Print command; use the Number of Copies field to click the up or down arrow to set the number of copies to make; select the Collate check box, if you want multiple copies collated. When using the Pages option, be sure to use a hyphen (-) with no spaces to designate a range of pages (such as, 5-10), and use a comma (,) followed by a space to designate nonconsecutive pages to print (such as, 5, 12, 14). Different applications might offer different options in the Print dialog box. For example, PowerPoint offers several options for what to print, including slides, handouts, or the presentation outline, and Outlook allows you to print e-mails in table or in memo style. When you finish making selections, clicking OK prints the document according to the selections you made.